1. 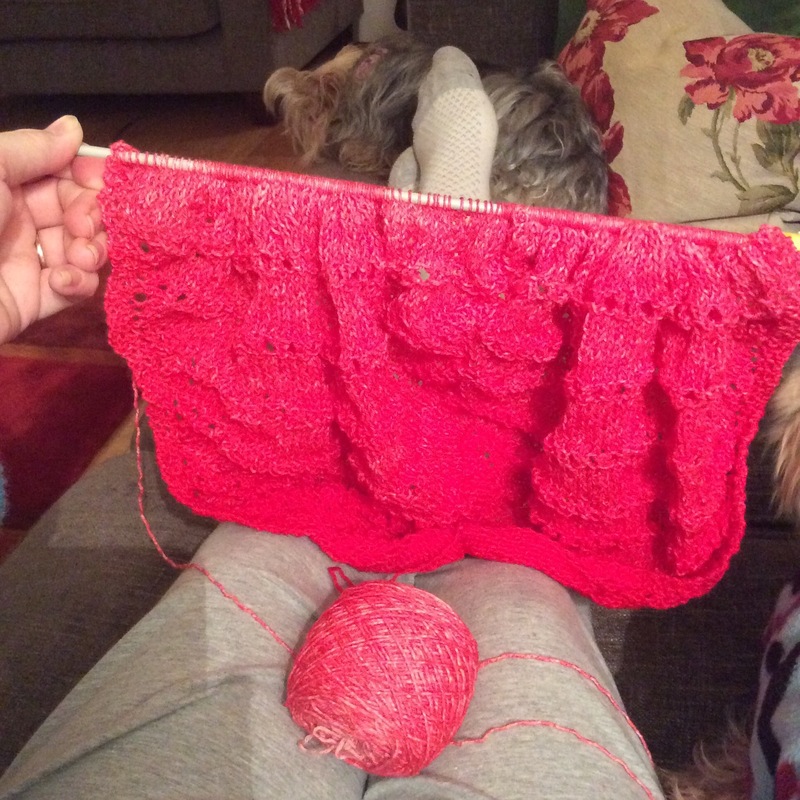 My Eyelet shawl is progressing nicely, although it never feels like it’s going to be big enough when you’re knitting it – blocking makes a world of difference and it magically doubles in size! 2. 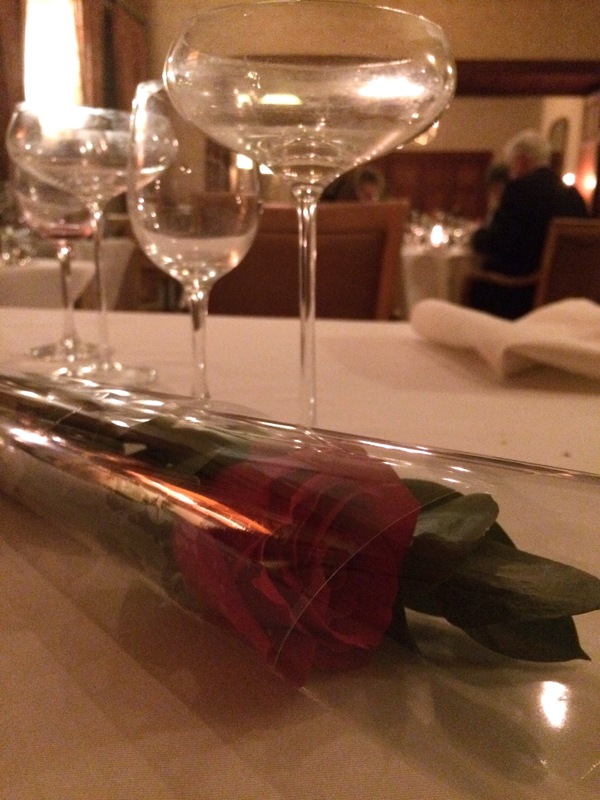 Valentine’s night was celebrated before the actual day as we couldn’t get a babysitter for the 14th, understandably. Mr H-L took me to our favourite hotel for a seven course meal which was amazing, as usual. I decided not to interrupt the evening by taking photos, but sneaked this one while he was in the loo. 3. 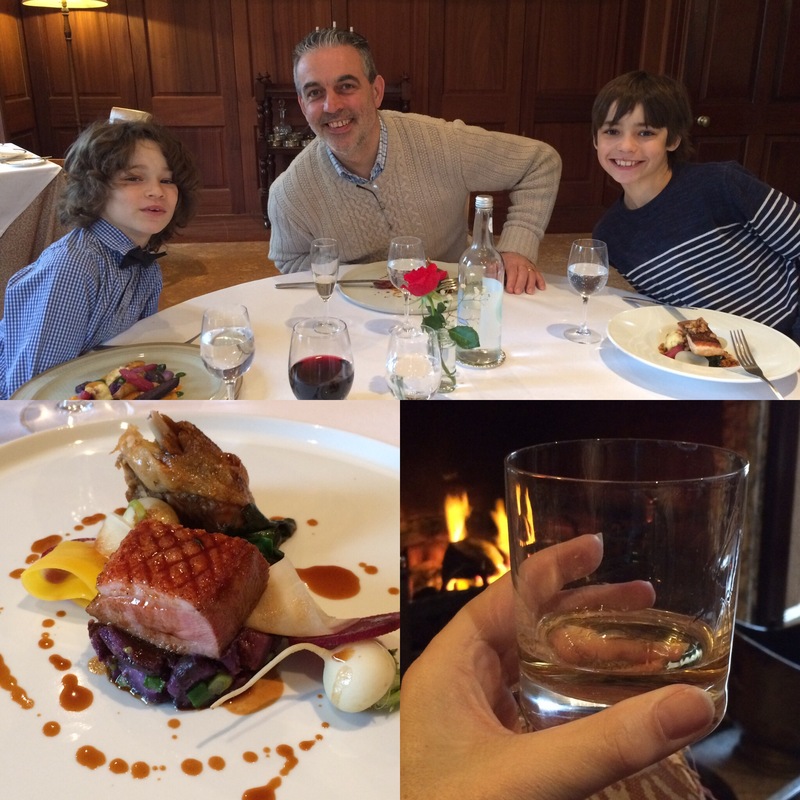 On Valentine’s Day itself, we thought it would be nice to take The Boys to a ‘posh’ hotel and give them a chance to use their table manners which have been drummed into them since they were old enough to hold a fork. We went back to our favourite place for the second time that week – and they loved it. 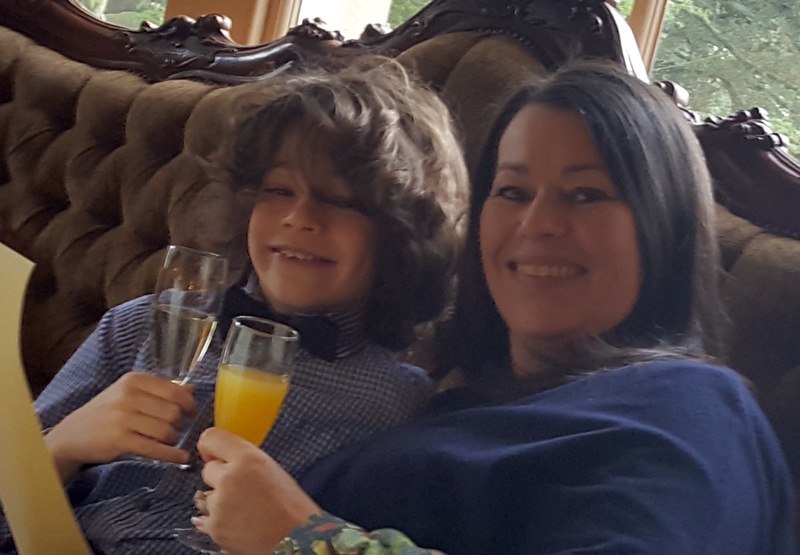 We started with champagne cocktails in the drawing room…. 6……followed by the most incredible three course lunch in the restaurant. No, the whisky wasn’t the third course! 7. Coffee and petit fours by the fire back in the hall. 8. 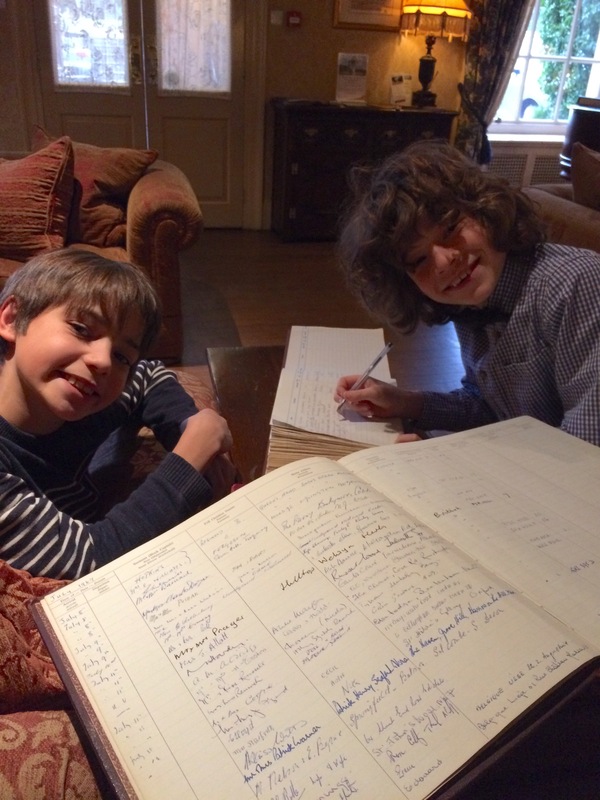 The Boys were fascinated by the pile of Visitor’s Books and wanted to go back to the first entry which was in 1969. They added their signatures to the latest book. 9. Fifi is back to her usual self after a nasty infection which we thought might finish her off! She keeps scaring the life out of us, but bounced back yet again this time. 10. Most of half term was spent up in Nottingham, staying with a cousin and her family. There is an extensive underground cave network which numbers over 600, most of which have been built on. This particular cave used to be used by Tanners and must have absolutely stank! 11. Broadmarsh Shopping Centre has been built over a lot of the caves and even the remains of old buildings. 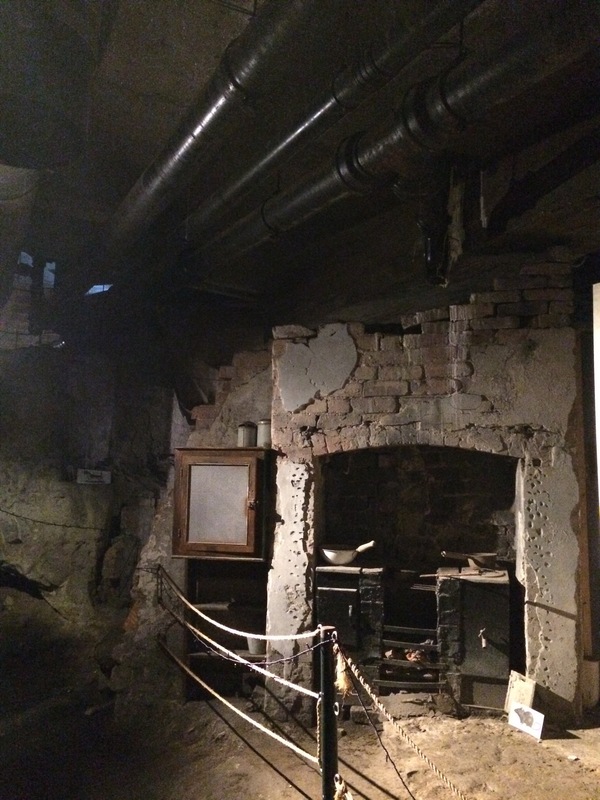 You can see clearly the fireplace with its original range still in situ, and what you can see above is the pipework underneath the base of the shopping centre! 12. Here again, the brick foundations of the shopping centre above are clearly visible on the right, as is more pipework and the floor of the building overhead. The ruins of a house stand as a record of how life in the city used to be. 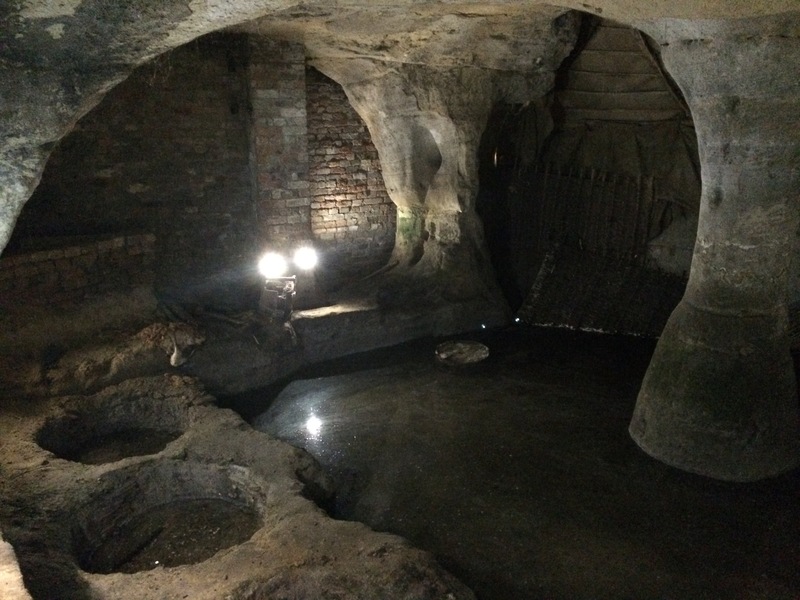 It was an utterly brilliant tour and fascinating to see what was under the city. 13. 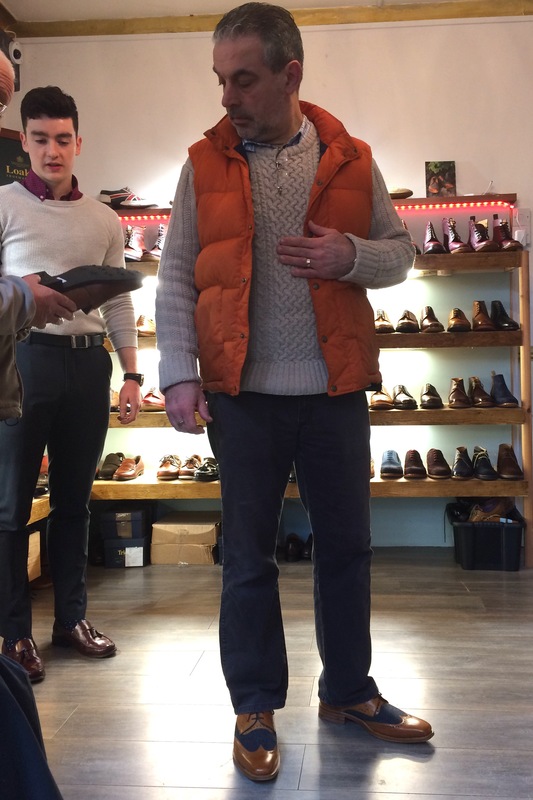 We happened upon a Loake shop (handmade shoes) whilst in the city centre, and Mr H-L, who already owns a pair of Loakes, was like a pig in s**t trying on all the shoes. 14. He came away with this tan pair, inset with Harris tweed. 15. 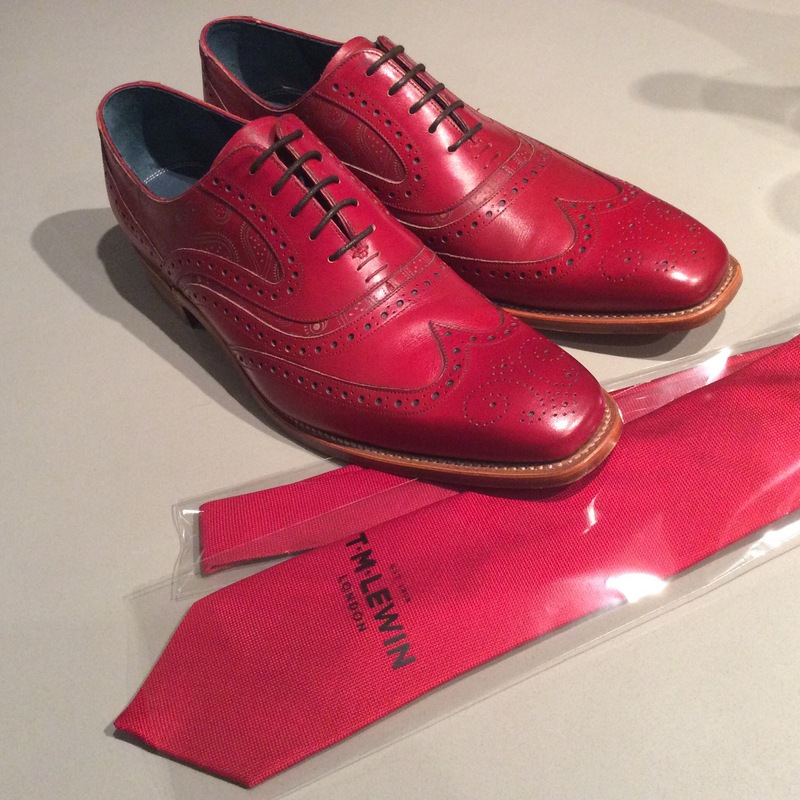 He also bought this red pair for which we had to go and buy a matching tie (much to the assistant’s amusement in the tie shop!) and a THIRD pair which are still being made. They cost a bloomin’ fortune!! 16. Shoe shopping makes you hungry, apparently, so lunch was at Yo Sushi. A new experience for me, as it’s a looooong drive to a town/city that has anything like this. LOVED it. 17. 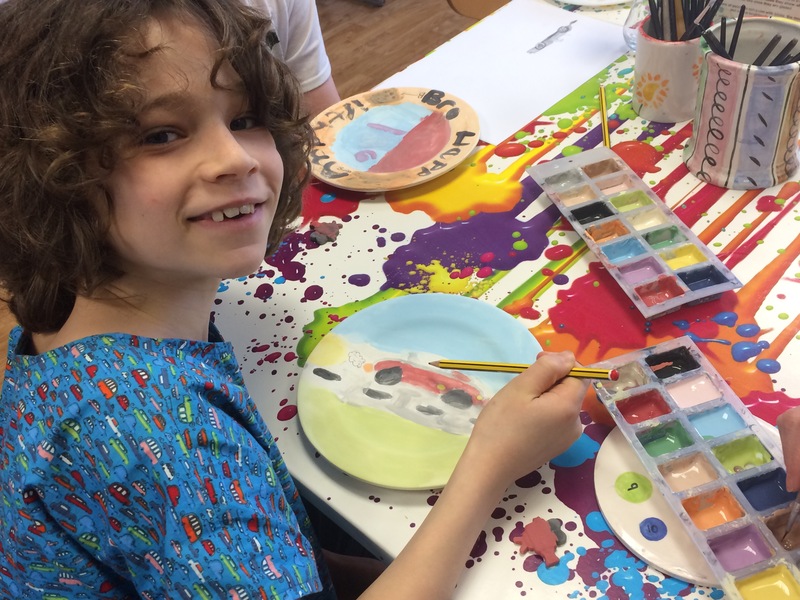 While we went charity shop browsing the next day, The Boys had fun in one of those pottery cafés that you see occasionally. 18. 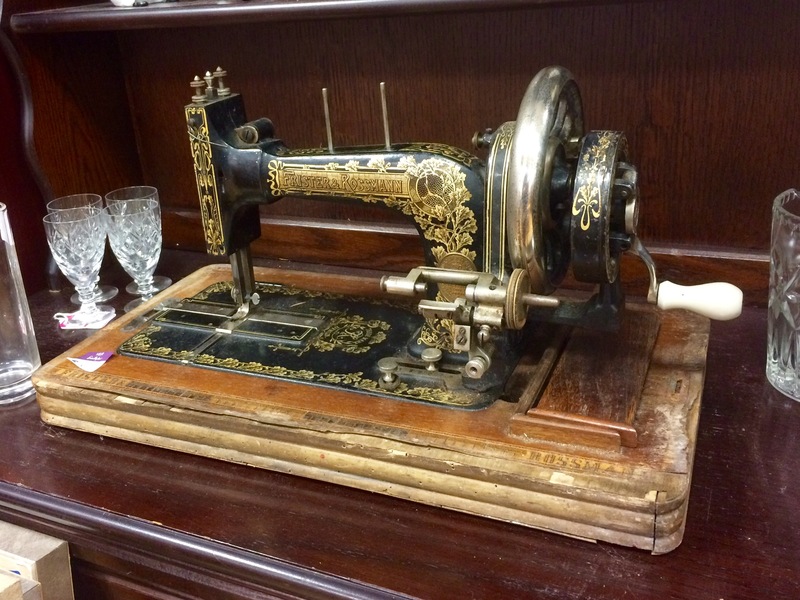 Had this been working, I would now be the proud owner of an ancient Frister Rossmann sewing machine. It was quite expensive, so I resisted the temptation. 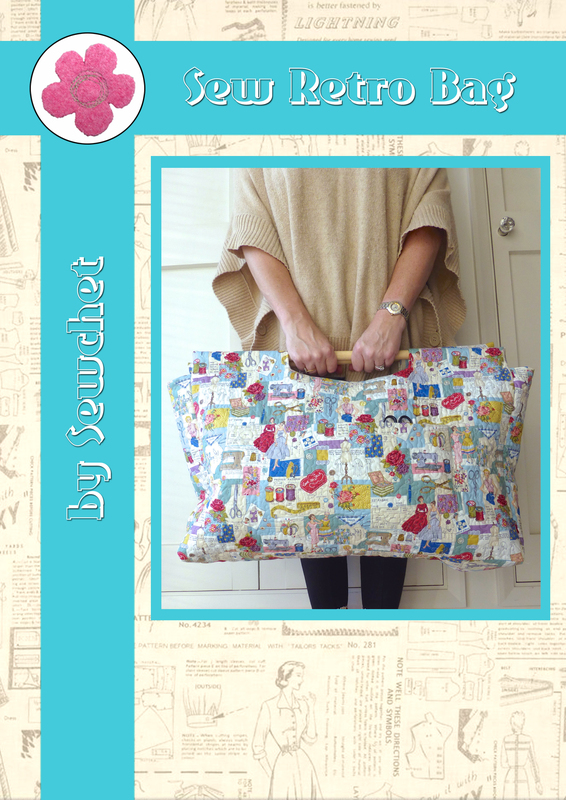 Linking up with Natalie at Threads & Bobbins, Sunday Sevens is where you show seven (or 18!) photos of what you’ve been up to outside the blog in the previous week. 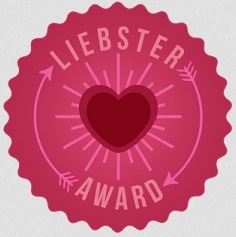 Categories: Sunday Sevens | Tags: caves, loakes, valentine, valentine's, yo sushi | Permalink. Quite frankly I was glad to find mens’ shoes that were more interesting than the usual black, brown or tan! Yo Sushi isn’t all about raw fish as they do roast duck, teriyaki beef, noodles, fried rice etc. etc. It’s ace! Wow, how awesome. I this the meals at the hotel are absolutely amazing. Great week all round, although pretty busy there. Lovely to see all you are getting up to. And the shoe shopping!! Even better!! Glad Fifi is better again, hugs to her from Miekie as well. Take care and enjoy. Greetings from a very wet and rainy Johannesburg. It’s pretty grey and miserable here, too – the hens are hating it. We’re lucky because, although we live in the country, we have this amazing hotel restaurant just a mile away. It was nice to see hubby fall in love with the shoes – mens’ shoes are normally so boring, aren’t they? Very true, mens shoes are pretty boring. The sneakers are nice, some brands, and then that is to casual. The shoes Mr.got are really great, and such a lovely colour too. Making a statement for sure. Snazzy shoes, snazzy underwear – is that a saying? Well, it should be. The underground cave network looks fascinating. I bet most of the shoppers overhead have no idea what lies beneath. Hooray for Fifi! She’s obviously determined to stay with her family for as long as she possibly can. I have that exact same sofa you are sitting on sipping champagne cocktails – it was one of the first things we bought together as a couple – 27 years ago. It ‘s now up on the mezzanine of the shed. I might get it down again one of these days as, apart from the seat cushions, it’s survived remarkably well considering it has been savaged by numerous kittens, puppies and kids over the years. Animals and kids certainly test the durability of your furniture, don’t they? Wouldn’t have it any other way though, and I am thankful for every extra day we have with Fifi as she has such a huge impact on our lives – all six pounds of her!! Goodness me , a chap who likes shoe shopping! The caves look amazing. I loved the tour I did in Edinburgh, which was quite similiar. Incredible what lies beneath our feet. Isn’t it just – makes me shiver to imagine life like that! We’re planning an Edinburgh break so will look out for that. 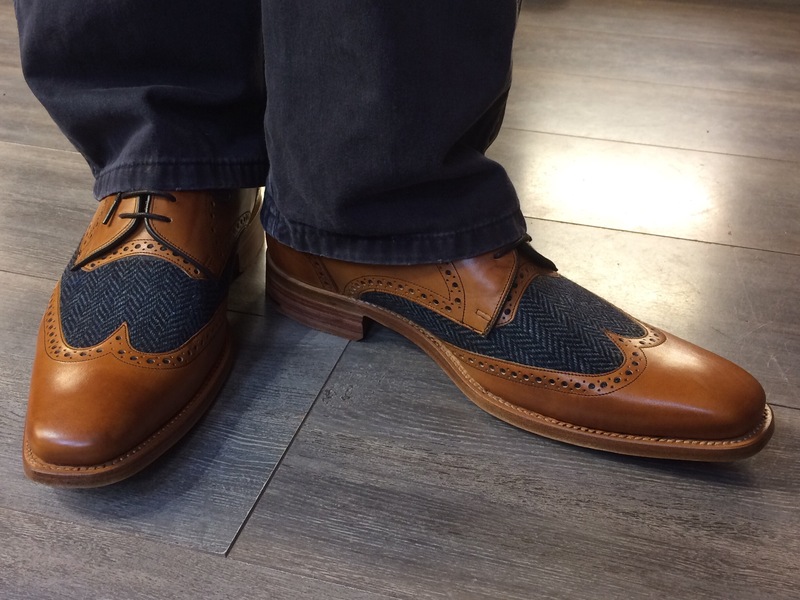 My husband is a huge fan of Loakes and will spend as much as a modest pair of shoes getting them resoled as determined as he is to get at least 10 years service out of each pair. 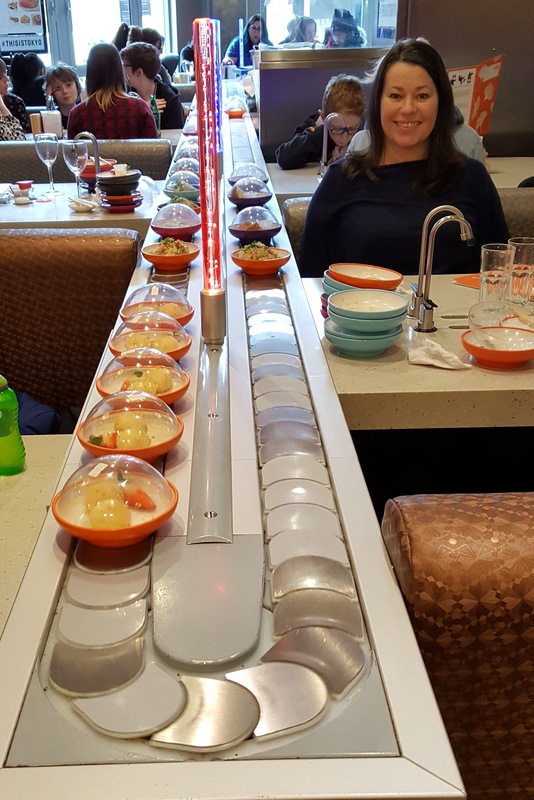 Yo Sushi is a favourite of mine and my daughters. Especially the hot stuff. Thank you, it is horrid when a pet is ill, especially at this age as you wonder if they’ll actually recover this time. WoW! That’s busy even for you. Are you sure it was only a week? Apart from loving how wonderful your boys are, I’m loving Mr H-L’s shoes most. Should I worry about that? Glad they’re being refined, but I couldn’t bare parting with them. Hope you don’t miss them too much when they go. Looks like you had a great week. Those shoes… glad to see some him supporting handmade. He knows the quality of handmade after living with me for so many years! How many other men would insist on handmade boxers?! Spoiled….. The caves and still-standing houses under the shopping centre, well, it was a fascinating to be there as it sounds. To see historic evidence like that was incredible. Me again. Wandered into the kitchen and suddenly realised you’d said Fifi was well again now. That is clearly the best bit of news! Really please to hear that. Think maybe you should move to Daily Sevens as your Sunday Sevens is clearly to much for my small brain to take in. Regarding my earlier comment about not documenting half of the stuff, Daily Dozen is probably more like it!! Fifi was back to the Vet last night as the wound won’t heal. More antibiotics and the threat of something more sinister. Still, 14 is a good age and we make the most of every day we get with her. As long as she’s fine in herself (which she is) we’ll keep her going. So sorry to hear that. Can’t find strong enough words to say how much I empathise. Doesn’t matter how well they do, their lives just aren’t long enough. Your eyelet shawl is an amazing colour!! 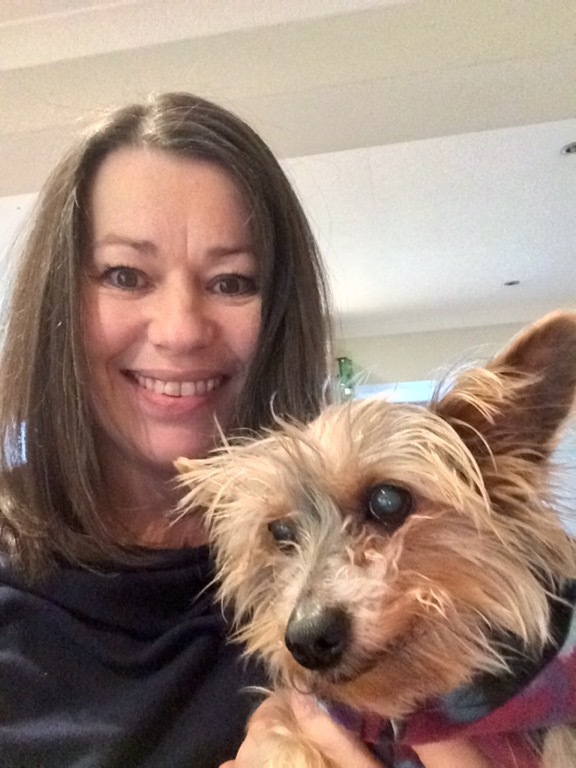 What a little fighter Fifi is…thank goodness she’s feeling better 😀 How lovely to get spoilt twice in a week at your favourite restaurant, your boys look as if they totally enjoyed it too. Mr H-L’s shoes-WOW_ great choices…wonder if he needs a Harris Tweed tie too though 😉 What a fun packed colourful week! Fifi is definitely a fighter for one so tiny, but she really is living on borrowed time now. 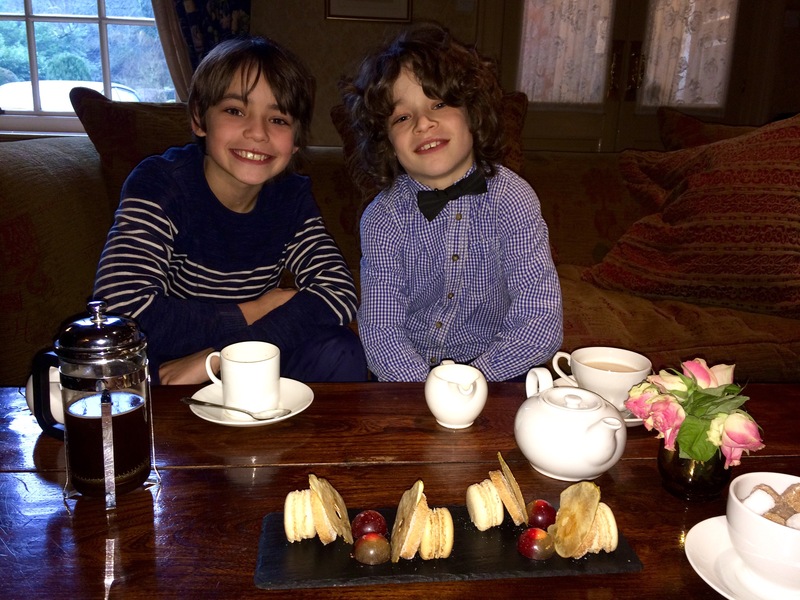 The Boys loved the ‘posh’ hotel – a little refinement before No.1 Son goes to boarding school in September (his choice, not ours – we must be rubbish parent!). A Harris Tweed tie sounds perfect! 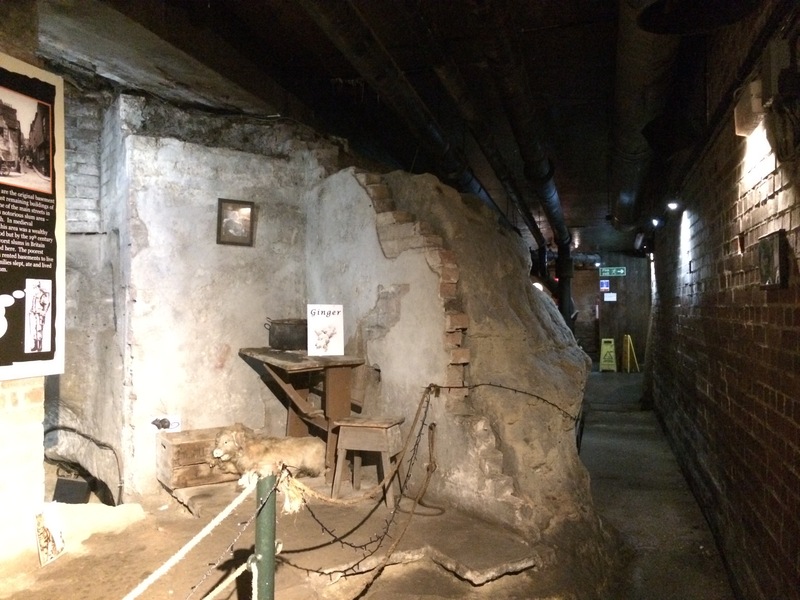 All the way through the tour I was imagining what life must have been like living in those slums and working in the caves – and all just over 100 years ago. How times have changed!